Cook black beans by rinsing them, then placing in a large pot with enough water to cover by an inch. When the water starts to boil, lower heat to a simmer, slap on a lid, and let the beans cook about an hour or until tender. You can also do this in a pressure cooker which would expedite the process. Drain the beans and set aside. Cook the black rice by adding it to a pot with 1 cup of water. Bring to a boil, slap on a lid, and let the rice cook 25-30 minutes until all the water has been absorbed. Let it stand, covered, for another 10 minutes. Roast the eggplant by spraying both sides with some oil and then placing, cut side down, on a baking sheet covered with tinfoil (not necessary but makes for way easy cleanup). Roast in a preheated oven at 350 degrees Fahrenheit for 30 minutes or until the eggplant is really tender and a knife pierced in the thickest part goes cleanly through. Cool the eggplant and then peel off the charred skin. Scoop the flesh of the eggplant into a food processor bowl along with the black rice and black beans. Add the remaining ingredients. Pulse five to ten times until the ingredients are evenly mixed but still textured and not pasty. Check seasoning, and add salt if needed. Remove to a bowl and mix in the rice flour. Shape into eight flat patties. These are quite hefty and you can make them smaller if you wish, for slider buns or just because. Heat a cast iron or nonstick griddle. Spray with some oil and cook the burgers, about four minutes on either side or until they are nice and charred. You can freeze these by separating with wax paper and throw them on the grill for the cookout. 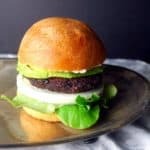 I served these with some onions, leafies, and avocado atop by whole-wheat hamburger buns and they were perfect.